The Interlace was envisaged as a ‘vertical village’ rising from the continuous green folds of the Southern Ridges. The intention was to challenge the accepted ‘norms’ for city condominium living, by using a unique architectural form that created a series of open spaces throughout the building at all levels. 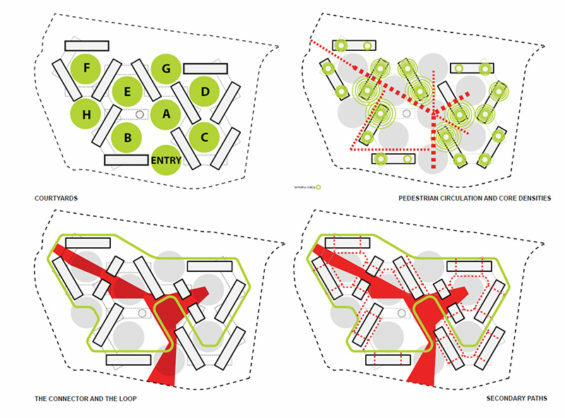 These communal, external spaces provide a counterpoint to the built form. Through their programming and design features the landscape fabric offers social, recreational, environmental and leisure opportunities. From the hexagonal spatial arrangement, a landscape of airy openness is derived. The landscape concept reinterpreted the forest strata idea to conceptualise a weaving of greenery through the building form and site in four strata; basement, ground, mid-levels and roof. The thirty one ‘super-blocks’ are stacked in a hexagonal arrangement that maximises views and cross ventilation. 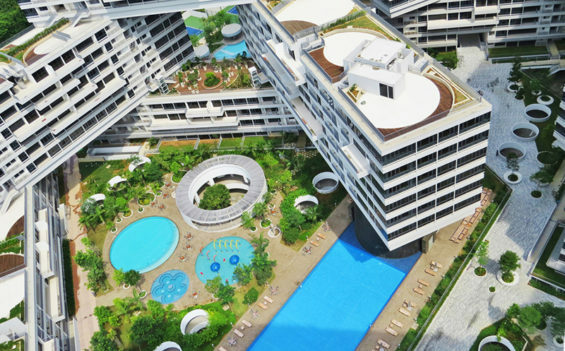 The geometric arrangement creates eight distinct spaces; ground-level courtyards that are foci for the adjacent blocks, shared spaces and amenities for the whole Interlace community. The elevated ‘covered’ areas between the blocks form nine public sky-terraces. These offer semi private space for residents. 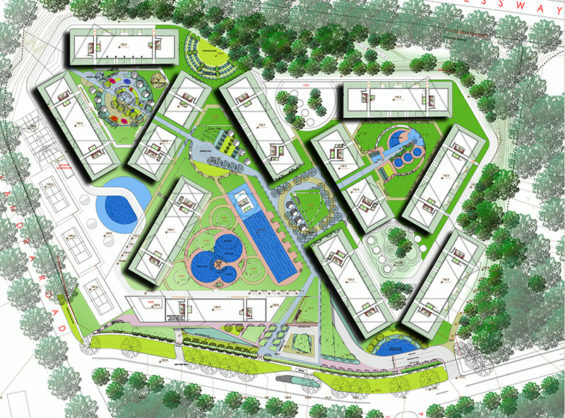 On top the ‘open’ roof spaces of each block are utilised as private gardens for the units. Using this unique arrangement a living landscape was brought right into the building form and private zones within each level. 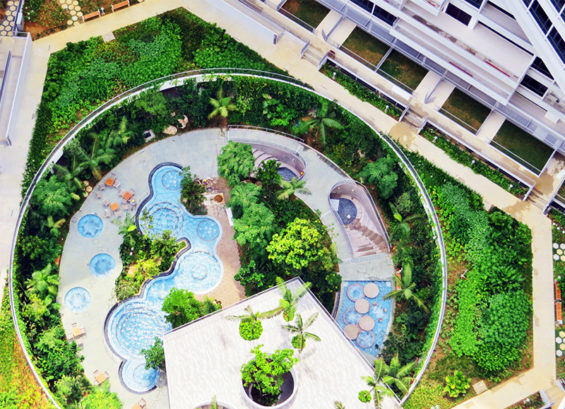 Each communal sky terrace is themed, either with an activity such as the Games Garden, or to showcase botanical elements such as the Bonsai garden and Garden of Essence. Planting extends up onto the private roof gardens and balconies, allowing residents to get involved in the care of the landscape within their shared environment. For a development of this size a whole range of multi-purpose external facilities have been accommodated throughout the site landscape, maximising views, connections, open space and shade from buildings and tree canopies in an interplay of shared and more intimate places that create a socially sustainable development. From the onset the importance of an extensive and comprehensive landscape solution was emphasised. Care was taken to ensure that there was sufficient soil volume over structure to allow for significant tree planting. Where ‘true-ground’ was available the planting opportunities were maximised. In order to ensure that the planting was mature enough at opening the plants were pre-grown for two years prior to installation. To achieve the diversity and to take into account the varying climatic conditions an extensive plant palette was used, creating a great deal of bio-diversity within the project. The landscape spaces were seen as an opportunity to foster a sense of environmental awareness and along with initiatives such as the resident’s garden it is hoped these will encourage involvement and individual sustainable practices. All eight courtyards evoke a different ambience through the choice of plant species and materials. These relate to the recreational uses within and around the courtyard. 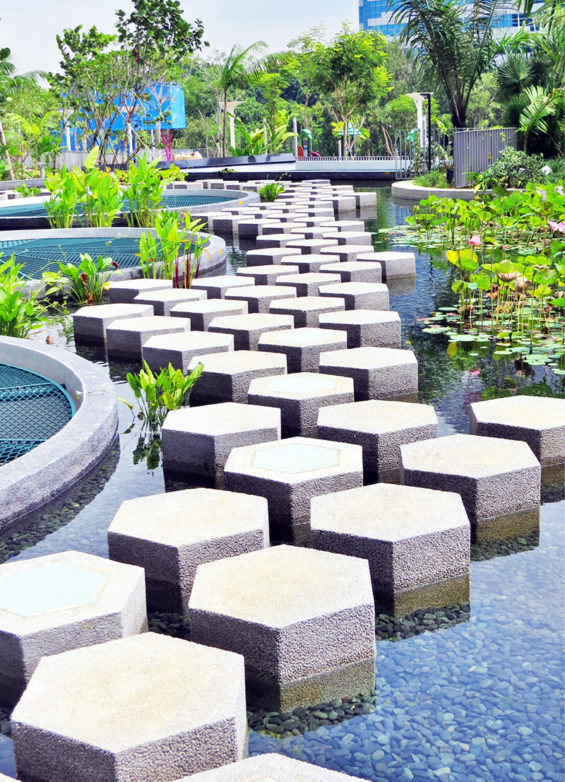 Along with the nine individually themed sky terraces the multitude of open green spaces provides a great deal of diversity within the landscape. The large variety and number of plant species encourage habitat creation and facilitates the migration of local fauna from the adjacent forested green belt. The softscape design was inspired by native plant species which feature throughout the development. The complex design of the building over a naturally ventilated car park, demanded a landscape that has been carefully integrated into the architectural fabric on every level. The landscape softens built edges and allows vertical greening into the building fabric. Planting in void spaces within the basement car park makes use of ‘true-ground’ opportunities allowing the planting of larger trees that will extend right up above the e-deck level. 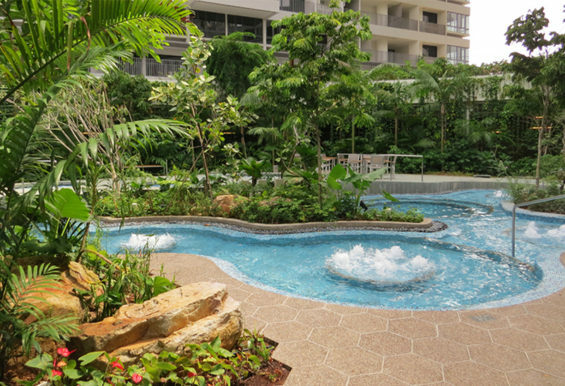 This gives a rich leafy atmosphere and enhances the natural connection with the forested surroundings, ensuring that natural planting is brought down to the basement car park, a space often neglected in residential condominiums. Even with the enormous scale and extent of the development over thirty existing trees, some glorious Raintrees with their spreading canopies have been conserved through site planning and coordination. This sustains existing ecological resources saving expenditure for site restoration. Preserving some of the site character, enhancing habitat for fauna and continuing the forested feel of the adjoining area, this adds an established quality to new development.